What is ZO® Daily Power Defense? 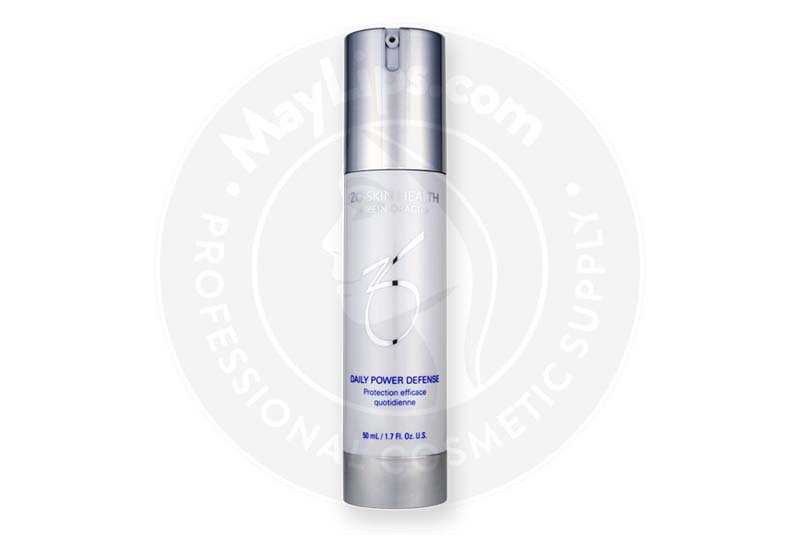 ZO® Daily Power Defense is lightweight lotion specifically formulated for patients with fine lines and wrinkles. Manufactured by ZO® Skin Heath, Inc, this lotion is made with ingredients, such as retinol, ultrasomes, roxisomes, ceramide 6, and Matrixyl 3000, that work together to even the skin tone and firm the skin. The cream works to help the skin repair itself while also improving the barrier function. In the package you will find 1 pump dispenser bottle containing 50mL of the lotion. Store the anti-ageing lotion between 15 and 30°C, away from direct sunlight. 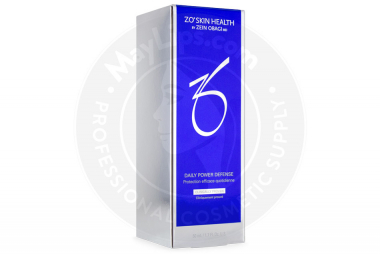 ZO® Daily Power Defense introduces enzymes that boost the recovery process of the skin. The lotion is suitable for patients with all skin types. Recommend this lotion to patients looking to combat free radical damage and for skin health support. Provides antioxidant protection against any future damage. All the ingredients in the lotion work together to provide patients a glowing and rejuvenated appearance. How does this lotion work? The lotion contains roxisomes and ultrasomes, which introduce enzymes to stimulate the natural repair process of the skin after it has been damaged by UV exposure. Retinol is known to stimulate collagen production and skin renewal, which help to promote a more even tone and texture. 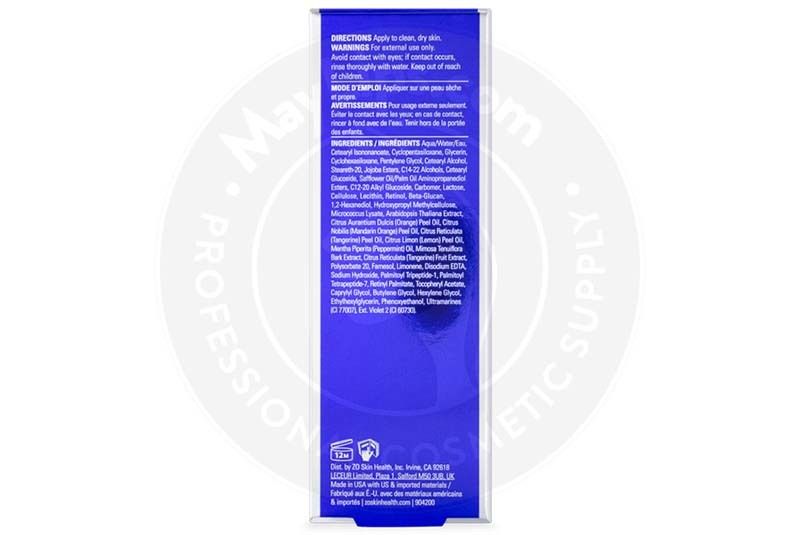 Matrixyl 3000 contains palymitoyl oligopeptide and palmitoyl tetrapeptide-7, which redensifies and firms the skin. Ceramide 6 helps to restore the function of the protective barrier of the skin. As well, vitamin E is an antioxidant that protects the skin from damaging free radicals. How often should ZO® Daily Power Defense be used? Advise your patients to use this anti-ageing lotion once a day in the morning. Before use, they should thoroughly cleanse and dry their face. Evenly apply the lotion to the face and neck. Patients may experience increased sun sensitivity when using this lotion. They should always apply sunscreen following the use of this lotion. Patients may use this lotion with other products from the ZO® skincare range. This anti-ageing lotion is considered a very safe and an effective product. Your patients should avoid using this lotion if they have any known allergies or hypersensitivity to any of its ingredients. The lotion is for external use only. Patients should avoid their eyes. Patients who are breastfeeding or pregnant should use this lotion with caution. This lotion may make the skin more sun sensitive. Advise your patients to always use sunscreen when exposing to sun. This anti-ageing lotion does not usually cause any severe side effects. However, some minor side effects may occur following the use of the lotion, but they are known to be mild, and resolve on their own within a week after the treatment. If skin irritation or rash occurs in patients, they should stop using the lotion until the rash disappears. If patients experience any allergic reactions, they should stop using the lotion and seek medical assistance immediately. This anti-ageing lotion is made of roxisomes (glycosylase) and ultrasomes (UV endonuclease), with the addition of vitamin E, ceramide 6, retinol, and Matrixyl 3000 (palmitoyl oligopeptide and palmitoyl tetrapeptite-7). Roxisomes (glycosylase) and ultrasomes (UV endonuclease) are enzymes that support the skin’s natural mechanism to repair skin damage. Vitamin E is an antioxidant that protects the skin from free radicals, and the damages that they can cause. Ceramide 6 enhances the skin’s protective barrier function. Retinol helps to tighten the skin for a more even tone and texture. Matrixyl 3000 (palmitoyl oligopeptide and palmitoyl tetrapeptite-7) redensifies and firms the skin. These ingredients combined make a lightweight lotion that is suitable for patients of all skin types. The lotion helps firm the skin while protecting it from any future damage. Name: ZO® DAILY POWER DEFENSE. Ingredients: Mimosa Tenuiflora Bark Extract, Lactose, 2-Hexanediol, Ultramarines (CI 77007), Aqua/Water/Eau, Citrus Nobilis (Mandarin Orange) Peel Oil, Citrus Limon (Lemon) Peel Oil, Safflower Oil/Palm Oil, Arabidopsis Thaliana Extract, Micrococcus Lysate, Beta-Glucan, Caprylyl Glycol, Lecithin, Hexylene Glycol, Retinyl Palmitate, C12-20 Alkyl Glucoside, Farnesol, Cetearyl Alcohol, Citrus Reticulata (Tangerine) Fruit Extract, Mentha Piperita (Peppermint) Oil, Palmitoyl Tetrapeptide-7, Hydroxypropyl Methylcellulose, Sodium Hydroxide, Glycerin, Polysorbate 20, Tocopheryl Acetate, Jojoba Esters, Citrus Aurantium Dulcis (Orange) Peel Oil, Ext. Violet 2 (CI 60730), Cyclopentasiloxane, Disodium EDTA, Cetearyl Glucoside, Pentylene Glycol, Cyclohexasiloxane, Palmitoyl Tripeptide-1, Carbomer, Phenoxyethanol, Steareth-20, Butylene Glycol, Ethylhexylglycerin, Limonene, Aminopropanediol Esters, Citrus Reticulata (Tangerine) Peel Oil, Retinol, Cetearyl Isononanoate, Cellulose and C14-22 Alcohols.